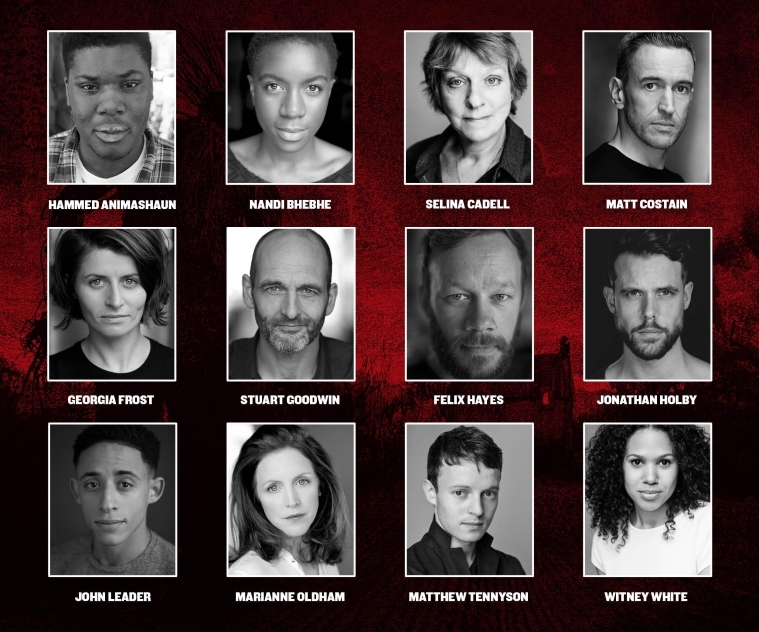 The Old Vic and Bristol Old Vic today announce full casting for the world premiere of A Monster Calls. Patrick Ness’ piercing novel A Monster Calls is brought to The Old Vic and Bristol Old Vic stages in The Old Vic’s 200th year in a powerful new adaptation by visionary director Sally Cookson. The cast includes Hammed Animashaun, Nandi Bhebhe, Selina Cadell, Matt Costain, Georgia Frost, Stuart Goodwin, Felix Hayes, Jonathan Holby, John Leader, Marianne Oldham, Matthew Tennyson and Witney White. Thirteen-year-old Conor and his mum have managed just fine since his dad moved to America. But now his mum's very sick and she's not getting any better. His grandmother won't stop interfering and the kids at school won't look him in the eye. Then, one night, at seven minutes past midnight, Conor is woken by something at his window. A monster has come walking. It's come to tell Conor tales from when it walked before. And when it’s finished, Conor must tell his own story and face his deepest fears. Sally Cookson, Director, said "The prospect of adapting Patrick Ness’ beautiful book is a tantalising one and I am chomping at the bit to get started. The story of thirteen-year-old Conor lost in a mire of anxiety and fear strikes a chord with anyone who’s been threatened with losing someone they love. The combination of gritty realism and magic make it perfect material for theatre - I love a challenge and the big question will be ‘How are they going to create a Tree Monster on stage?’ Come and find out!" Patrick Ness, Writer, said "A Monster Calls has always been a collaboration, in all its forms. I like to say I took the baton from the late, great Siobhan Dowd, then handed it on to our illustrator Jim Kay, and what came out was something bigger than anything the three of us could have done by ourselves. I'm now so excited to hand that baton on to the amazing Sally Cookson. She's assembled an outstanding company. What a treat this is going to be!" Nandi Bhebhe plays Teacher. Her theatre credits include The Tin Drum(Liverpool Everyman/UK tour); Twelfth Night, 946, A Midsummer Night’s Dream (Shakespeare's Globe); A Season in the Congo (Young Vic); Fela! (National Theatre/Broadway) and 5,6,7,8 (Royal Court). Selina Cadell plays Grandmother. Her theatre credits include Humble Boy(Orange Tree Theatre); The Dresser (Duke Of York’s); People, The Habit of Art, Stanley (National Theatre); The Line (Arcola Theatre); The Cherry Orchard (The Old Vic); The Clean House (Sheffield Crucible); The Government Inspector (Chichester Festival Theatre); The Rivals (Bristol Old Vic); A Midsummer Night’s Dream (Albery Theatre); Twelfth Night and Uncle Vanya (Donmar Warehouse). Her television credits include Love Nina, The Lady Vanishes, Father Brown, Upstairs Downstairs, Toast, Spooks, Lewis, Midsomer Murders, Bremner, Bird and Fortune, The Catherine Tate Show, The Amazing Mrs Pritchard, Casanova, Foyle’s War, Sword of Honour, Great Expectations, As Time Goes By, People Like Us and Doc Martin. Her film credits include The Lady in The Van, Papadopoulos & Sons, Gambit, Nativity, Hereafter, Confetti, Snowcake, Festival, Matchpoint, Mrs Dalloway and The Madness of King George. Matt Costain is in the ensemble. His theatre credits include La Strada(West End/National tour); Hetty Feather (West End/ National tour); Wendy and Peter, Henry IV, Henry V, Henry VI, Richard III (RSC); War Horse,The Birds(National Theatre); Macbeth, Pericles, Man Falling Down (Shakespeare’s Globe); The Tempest (Regent’s Park Open Air Theatre); A Midsummer Night’s Dream, Dr. Faustus, The Master and Margarita (Chichester Festival Theatre) and Treasure Island (Theatre Royal Haymarket). Georgia Frost plays Sully. Her theatre credits include The Taming of the Shrew (Shakespeare’s Globe) and Little Mermaid (The Egg). Her television credits include Casualty, Magic of Musicals and Fred and Rose. Felix Hayes plays Dad. His theatre credits include Vice Versa, The Tempest, Comedy of Errors, Twelfth Night, A Midsummer Night’s Dream, City Madam, Cardenio, A Midsummer Night’s Dream (RSC); Peter Pan, Jane Eyre (Bristol Old Vic/National Theatre); One Hundred and One Dalmatians, The Adventure of Pinocchio, The Tempest, A Midsummer Night’s Dream, Ali Baba and the Forty Thieves and A Christmas Carol (Tobacco Factory). His television credits include Three Girls, A Gert Lush Christmas Special, Drunk Histories, Friday Night Dinner and Roisin Conaty. Jonathan Holby is a Swing (London performances only). His theatre credits include A Tale of Two Cities, Lord of the Flies, Peter Pan (Regent’s Park Open Air Theatre); Mirrorball (Arcola Theatre) and The Renaissance Body (RSC). His television and film credits include Queens, The Terrible Tale of Henrietta Tate, The Intent, Blood and Glory and Beatgirl. John Leader plays Harry. His theatre credits include Vivaldi's The Four Seasons: A Reimagining (Shakespeare's Globe); The Lion, The Witch and The Wardrobe (West Yorkshire Playhouse); Peter Pan, War Horse (National Theatre); Running Wild (Regent’s Park Open Air Theatre) and Romeo and Juliet (Orange Tree). Marianne Oldham plays Mum. Her theatre credits include Rosencrantz & Guildenstern are Dead (The Old Vic); The Argument (Hampstead Theatre); The Boy in the Striped Pyjamas (Chichester Festival Theatre); Sons without Fathers, Uncle Vanya (Arcola Theatre/The Belgrade Theatre); You Can Still Make a Killing, The Cherry Orchard (Southwark Playhouse); An Inspector Calls (West End) and How Many Miles to Basra (West Yorkshire Playhouse). Her television credits include The Living and the Dead, Life in Squares, The Musketeers, Foyle's War, The Crimson Field, Doctors, The Impressionists and WPC56. Her film credits include Finding Your Feet, Absolutely Anything, Silent Girl, Titus and 500 Miles North. Matthew Tennyson plays Conor. His theatre credits include Making Noise Quietly (Donmar Warehouse); Flare Path (Theatre Royal Haymarket); Salomé (RSC); Cleansed (National Theatre); The Seagull (Regent’s Park Open Air Theatre); A Breakfast of Eels (The Print Room); A Midsummer Night's Dream (Shakespeare's Globe) and Beautiful Thing (Manchester Royal Exchange). His television credits include A Midsummer Night's Dream, Grantchester; Humans, Babylon, Father Brown and The Hollow Crown. His film credits include Making Noise Quietly. Matthew received an Evening Standard Theatre Award for Outstanding Newcomer in 2012. Witney White plays Lily. Her theatre credits include Loserville (West End); Wonderland (National Theatre); Dusty (Charing Cross Theatre) and Room(Stratford East/Dundee Rep/Abbey Theatre). Her television credits include Clean Break and Doctors. Sally Cookson trained at LAMDA and worked as an actor for ten years before embarking on a freelance directing career. Her theatre credits include The Lion, The Witch and The Wardrobe (West Yorkshire Playhouse); Jane Eyre and Peter Pan (Bristol Old Vic/National Theatre). She is an associate artist at Bristol Old Vic, where other productions include Sleeping Beauty, Treasure Island, The Boy Who Cried Wolf, Papa Please Get the Moon for Me, Clown, Strange Case, Pericles, Pains of Youth and The Visit. Her numerous collaborations with Travelling Light theatre include Strictly Balti, The Ugly Duckling, Boing!, How Cold My Toes, Shadowplay, Cloudland, Lennyand Bob the Man on the Moon. Other theatre includes One Hundred and One Dalmatians, Ali Baba and the Forty Thieves, Cinderella - A Fairytale (Tobacco Factory Theatre, Olivier Award nomination); La Strada, Hetty Feather (Olivier Award nomination); We’re Going On A Bear Hunt (Kenny Wax Productions); Romeo and Juliet (The Rose Theatre); Stick Man and Tiddler (Scamp Theatre).